My last weeks in Japan arrived sooner than I expected--and found me with things still undone and places still unvisited. These included riding a bullet train and seeing the Atomic Bomb Dome in Hiroshima. After I shipped my household goods and moved out of my house, I took the super-express Shinkansen train to Hiroshima. The Japanese countryside zipping past the train window varied from cities to rice paddies and distant mountains. I bought coffee (300 yen for a small cup) and sandwiches from the snack cart that came through my car. The restrooms between cars offered a choice of Western or Japanese toilets. For five hours I glided across the country in my comfortable reserved seat. We made nine brief stops. Today's Hiroshima could be considered only fifty years old. Ninety-two percent of its 76,000 buildings were destroyed on August 6, 1945, when the first atomic bomb in history dropped at 8:15 AM. 200,000 people died. Hiroshima, with a population of 350,000, had been known as an education/military center because of its schools and its concentration of military facilities. Then came a four-ton bomb named "Little Boy," with a blinding white flash, a fireball and blast whirlwinds. Flames rushed through the city and black radioactive rain covered everything. The most famous reminder of that day is the Atomic Bomb Dome along the Ohta River. The dome's original building was built in 1915 and used as a government office. The dome is now a "historic ruin" on the United Nations list of World Cultural and Natural Heritage sites. It has been repaired twice to preserve its ruined state. A maintenance official stated, "It is very difficult to maintain a broken building just as it was after the atomic bombing." Because Hiroshima has sufficient resources, it gets none of the United Nations funding available for protection of World Heritage sites. On the opposite side of the river from the Atomic Bomb Dome is the Hiroshima Peace Memorial Park. Numerous memorials and monuments are scattered throughout the park. A 1949 Hiroshima Memorial City Reconstruction Law designated this area near the hypocenter to be rebuilt and used as a peace memorial facility. 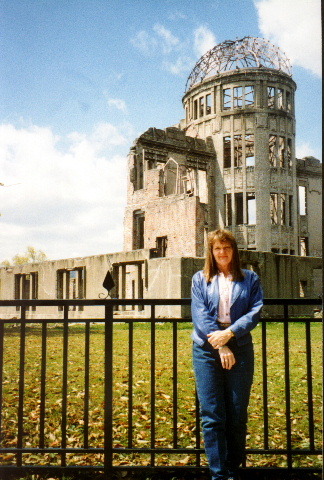 The Hiroshima Peace Memorial Museum in the park contains a collection of artifacts, photos and exhibits. One clump of glass had been a box of bottles that melted and fused together. The photos of people with strips of skin hanging loose were too awful to inspect closely. Exhibits and videos discussed the nuclear age and today's efforts at disarmament. A timeline of labeled photographs described Hiroshima's history. "In 1931 the Manchurian Incident led to the Japanese army's engagement in armed conflict in China. By 1937 the incident had become a full-scale war between the two nations. "In 1941 a surprise attack on the U.S. naval base at Pearl Harbor hurtled Japan into the Pacific War (World War II), allied with the Axis powers." The story then picked up with Hiroshima's rebuilding, and its efforts to eliminate nuclear weapons from the world. Museum literature speculates the United States dropped the bomb to force a Japanese surrender and minimize American casualties. A second reason was to convince the Soviet Union of U.S. nuclear dominance. Hiroshima was chosen because it was one of Japan's few cities not already destroyed by U.S. air attacks. Its high concentration of military factories had not been significantly damaged. Also, its size and location on a plateau in a mountain ring made it a good test bed to observe the destructive power of the atomic bomb. One of the monuments in the peace park is the Children's Peace Monument, built in 1958 and dedicated to the memory of a girl named Sadako Sasaki. At age two, she survived the bomb blast, but contracted leukemia in 1955. Before her death later that year, she made a thousand paper cranes as a prayer for health. What I first thought were piles of flowers at the base of the monument were actually strings of paper cranes. Children from all over the world send paper cranes to "represent the dream of peace for the future," as the monument's inscription reads. Looking at old photographs, I identified the areas we walked through. However, the warm spring sunshine and green trees and grass made the earlier devastation impossible to comprehend. Spring in Japan is cherry blossom time. Traditionally, it's when people come out after a long winter and socialize. I spent Easter weekend in Tokyo, and saw cherry blossom parties wherever there were cherry trees. People sat on tarps under the trees, with food and friends and sake or beer. The beauty of cherry trees in bloom is my last memory of Japan.